I bet Xavier would have preferred Magneto had given his eulogy, if only for the eloquence. But then again, it would probably have disintegrated into a militant call to arms for Homo sapiens superior uprising and the extinction of humanity. Such is Professor X's lot in life, and death, I suppose. Here we are, Marvel NOW! The relaunch of excitement into the Marvel Universe, following the events of the Avengers vs. X-Men crossover event. The Phoenix Force came to Earth. The X-Men, under the command of Cyclops, sought to embrace it, to re-ignite the flame of the dying mutant race. The Avengers wanted to save the world from the Phoenix Force. So they fought, and fought, and fought. The Phoenix claimed five of the X-Men and turned them into The Phoenix Five. The Avengers were beaten back. The Phoenix Five conquered and changed the world. The Avengers defeated the Five one by one, until only Cyclops remained as the new Dark Phoenix. Cyclops murdered Professor X. The X-Men allied themselves with the Avengers against the mad Cyclops. Hope, the mutant messiah, and the Scarlet Witch together defeated Cyclops. Hope became the Phoenix and healed the world. The Phoenix Force restarted the mutant race - new mutants were created around the world- and then it left Earth. Cyclops was imprisoned for his crimes against humanity. And Captain America learned a lesson. Uncanny Avengers #1 follows up on AvX, dealing with the aftermath of the loss of Charles Xavier. At the Jean Grey School for mutants, its current headmaster Wolverine gives the eulogy at Xavier's funeral. Kind of depressing. "Truth is, we failed [Xavier]", Wolverine concludes, before walking away from the podium. Watching on a monitor from parts unknown , hiding from the Avengers, was Magneto, Xavier's oldest frenemy, who no doubt thinks he could have done a better job. At The Brig, the secret S.H.I.E.L.D. holding facility where Public Enemy #1, Scott "Cyclops" Summers is being held in a ruby quartz prison, his brother Alex "Havok" Summers pays a visit. The brothers argue about Cyclops failing Xavier's dream, murdering him, and how basically Cyclops hasn't done anything right, ever. If Cyclops is hanging his head in shame, he's doing so on the inside. Cyclops defends everything he did. In a way, you kind of have to respect his standing by his convictions, even if they turned out to be all wrong. Or were they? The mutants are back, after all, no longer on the brink of extinction. Havok doesn't accomplish much, but he does get asked out on a coffee date. Oh, that God of Thunder and his lattes. 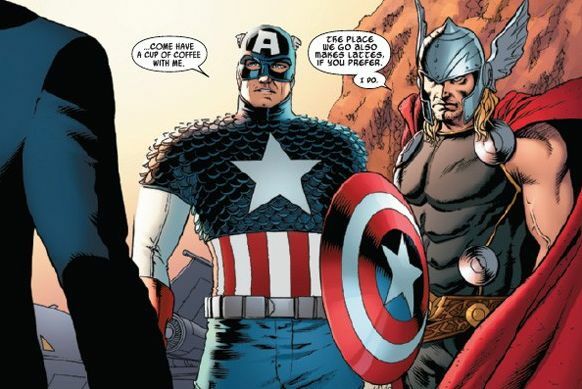 Captain America, who learned in AvX that the Avengers have never done enough to help the mutant population, has a proposition: he asks Havok to become an Avenger. 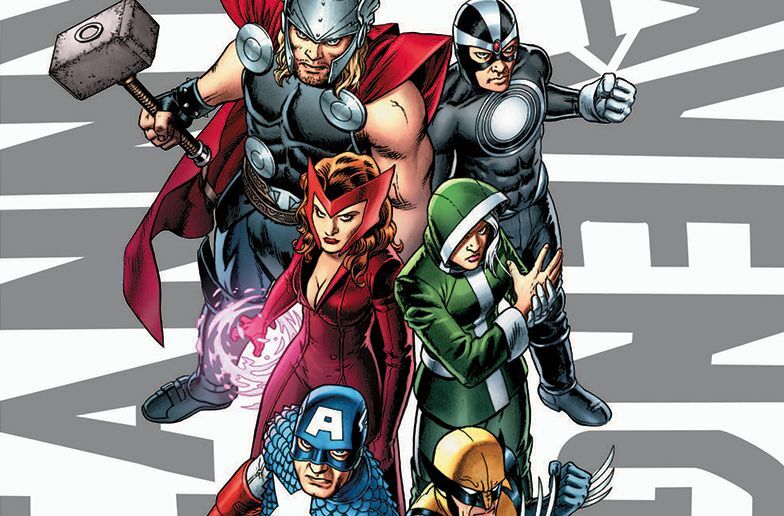 Not just any Avenger, but to lead a squad of X-Men and Avengers working together - a team of Uncanny Avengers (Cap doesn't call it that). And yet, Cap's sales pitch needs work: He basically said, "Havok, we're asking you because Wolverine, the most popular X-Man, is too shady for this, Cyclops is in prison, and, well... There's no one else. So you're the best man for the job, since we've no better options. How's about it, soldier?" Havok is, understandably, not jumping on the line or asking about the Avengers' dental plan. Next thing we know, New York is under attack, which happens every 6.2 seconds in the Marvel Universe. The mutant known as Avalanche decides a couple of blocks from Avengers Mansion is the perfect place to start ripping up sidewalks and blowing up buildings. Thor springs to action to save lives while Captain America on the spot comes up with a brilliant tactical move using Havok's mutant power to shoot concentric circles of energy as a springboard. But rather than face Captain America and get smacked with a star-spangled shield in the face, Avalanche chooses to fall to his death. It's weird. But the damage is done. Once again, a mutant acted like a terrorist and threatened lives, creating hate, fear, and mistrust. Old habits die hard. Stinkin' muties. The Red Skull! Who now has Charles Xavier's brain! And he's going to stick it in some corpse and use it to bring the world to its knees! Why, that nefarious Nazi!